Classic Thumbprint Peanut Butter Dog Treats - Sweet and chewy, these treats won't last long once your dog has a taste. Easily change up the color and taste of these treats buy using different varieties of sugar free fruit jams. March is National Peanut Butter Month, so don't hesitate to make these tasty morsels. 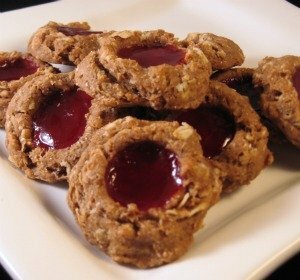 These thumbprint cookies are fun to make. However, I found that I was lousy at making little indentations with my thumbs. I realized I had a challenge on my hands. So I started to look around the kitchen for a hardworking dual-use utensil. That's when my little candy thermometer jumped into my hands and said "I'm ready to go to work!". The face of mine is about the size of a nickle, and the thermometer part was perfect to use as a handle. I placed the face of the thermometer on the center of the cookie, then gently pressed down and wiggled. As I did this I watched the cookie, and kept it as a round shape by coaxing any of the sides that were trying to get out of shape with my fingers. Add variety to these treats by using any flavor of fruit jam. But, make sure that whichever one you choose it is sugar free. Our dogs don't need all that extra sugar in their homemade dog treats. Do you enjoy making homemade dog treats that are just as adorable as the ones you see in professional dog bakeries? Then you may want to consider starting a dog treat business. To help you get started, read my review of the book about how to start your own dog bakery business. Have you been looking for a certain dog treat recipe? Or, are you longing to use a specific ingredient in your homemade dog treats? Then you'll want to use our Custom Search Box. By entering an ingredient that you'd like to bake with, you'll find every recipe, and mention of that ingredient on our website. "I made the peanut butter bacon biscuits for our German Shepherd, Maya, and you were right, drool on the floor!" "Thank you so much for your efforts and hard work. I just found a few nice recipes for my new son "Titus" and have made him about 3 different treats now. He loves them and they are cost effective (much cheaper than buying treats at the store). Thank you so much!" Do You know how to measure flour? OK, it sounds easy, but there is a right way to measure it. You will need your flour, the measuring cup, a large spoon and a butter knife. Start by stirring up the flour in the sack with your spoon. Then scoop a heaping spoon full and gently shake it into the measuring cup. You will most likely get flour all over your counter. I typically will put down a paper towel first. Then when I'm all done, if I've spilled a lot, I'll pick up the paper towel and funnel it back into the flour sack. Keep scooping and gently shaking the flour into your measuring cup until it's slightly over filled. Then take the back of your knife, level it on the top of the measuring cup and scrape all the excess off the top. Resist the urge to shake the measuring cup and make the flour settle. This process will give you lighter dog biscuits and make the dry to wet ingredient ratio considerably more accurate when making your homemade dog treats. Share your tips and they might be featured in our newsletter. Or, if you have a baking question you'd like answered here, let us know and the answer could be published in the next issue.